Its great to see Hollywood's most successful filmmaker - James Cameron - following on from the success of his film Avatar, make a trip to the Amazon to declare support for the indigenous people threatened by our all-consuming economic development. Avatar, of course could easily be seen as a depiction of the plight of our Huaorani partners in the face of ever encroaching oil development. 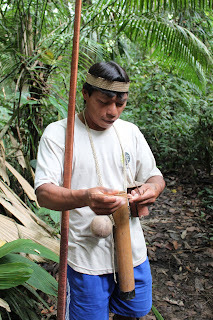 Our ecotourism project with the Huaorani is small in scale but huge in its potential to show an alternative to destructive development models. Huaorani Ecolodge generates real and sustainable benefits for the host communities and for the guests who come to visit from around the world to experience the rainforest reality that inspired the film. Photo: Huaorani guide, Omene Paa, demonstrates how the Huaorani use blow guns to hunt silently in the forest. During these demonstrations no wildlife is ever harmed.